Jarrah is a rich, reddish timber and it is prized for its rich warm color. Jarrah is heavy and hard. Jarrah grain is usually straight, even textured, sometimes displays decorative flecks on flat sawn surface. Below average – Change Coefficient .00396 – 7% less stable than Northern Red Oak. The jarrah tree is part of Australia’s government supervised reforestation program. Only a small part of the jarrah forest may be harvested annually, thus assuring the future of this remarkable species. 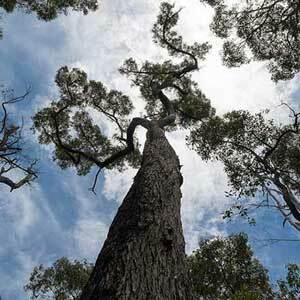 The tree species jarrah, Eucalyptus marginata, grows up to 130 feet tall and can live to up to 1,000 years old. Australian craftsmen use jarrah, a eucalyptus that resembles mahogany and teak, for fine furniture, cabinets, and wall paneling. But since the Aussies started exporting jarrah in the 1800s, the rest of the world has found it more suitable for docks, bridges, and decking. In fact, jarrah was used to pave a Hastings, England, street in 1897. Recently, the Down-Under hardwood replaced treated pine in the oceanfront boardwalks of some New Jersey cities — most notably famed Atlantic City. There, 50,000 board feet of jarrah was installed last year as the first step in an extensive renovation. Jarrah is a rich, reddish timber and it is prized for its rich warm color. Jarrah is heavy and hard. Jarrah grain is usually straight, even textured, sometimes displays decorative flecks on flat sawn surfaces. However, other variations in Jarrah grain may be present. Jarrah is extremely durable and resistant to insect attack, making Jarrah viable for indoor and outdoor uses. Jarrah undergoes a medium degree of color change over time by muting to a medium to dark burgundy-red as it ages. Jarrah has a variety of uses including marine work, ship building, construction, weatherboard, flooring, and furniture. Jarrah has properties that are appropriate for chemical vats. The trees are also used for producing honey. Heavy, hard, strong (particularly crushing strength), and stiff with moderate dimensional stability in service. Highly decay resistant heartwood. Steam-bends moderately well. Fairly difficult to work due to hardness and density. Reduced cutting angle recommended for planing. Turns well. Pre-drilling required for screwing and nailing. Glues and finishes well.